Recyclables separated at source are more likely to provide recycling certainty. Not all recyclable materials collected are sorted and sent for recycling into new products. We consume to live, we always have and always will. But we want different lifestyles, and our choices dictate our desire and consumption. Waste is directly linked to the basic cycle of human desire and consumption. More things are desired (choice, diversity, evolution, population growth). So more things are consumed and more waste is generated. Consumption is affected by the degree of our desire, and our ability to meet our desire. e.g. Local community stalls (home made) versus international trade (made in China). Buying as much as we can for as little as we can presents major challenges. Little = not just $ costs, but time and effort, the convenience factor!!. It’s easy to consume less and produce less waste (mainly packaging): Control and prioritise our desires, change our perception of inconvenience, and recycle what you can. Most of us rely on our waste collection company to provide the right services and to do the right thing when it comes to recycling and disposals. All true recyclable waste collection providers should price their services on the collecting the largest amounts of pre-sorted, clean and un-contaminated recyclable waste resources in the shortest time possible at the lowest cost. The service fees we pay allow for a contribution from the value of the recyclable materials collected; the more there is the less the cost and, in some instances, a bulk collection rebate may be available. The cost model for collecting rubbish is different to collecting recyclables. Rubbish collections are typically overly-frequent and the bins are partially-filled (so our costs are driven by the number of collections), whereas recyclable waste collections are less frequent and the bins are full (so our costs are driven by the amount collected). This is a key point that needs to be understood by everyone with waste-disposal responsibilities. In many cases recyclable waste collection services can actually keep rubbish collections costs down. Ask your collection company to provide clear evidence that your recyclables are actually recycled. The biggest problem caused by not recycling is the residual damage to our environment: plastic bottles, plastic bags, metal cans, glass bottles all left lying around taking many many years to breakdown while in the meantime wreaking havoc on certain wildlife - as well as us humans. In many countries there is a sustained and focused effort placed on real recyling efforts, with either penalties imposed or rewards provided for bad and good public (and corporate) recycling behaviour. We are supposedly 100% PURE as an international brand, however if we want to aspire to this status we have a lot of catching up to do if we want to be like other countries (such as the UK, Australia, Germany, Spain, France). Our "We are the Solution" page has some great examples of NZ companies and products championing the cause, of what local authorities are doing and what is happening overseas. Cardboard and paper will naturally breakdown easily and are easier to recycle (to identify, handle, collect and process). The main challenge for most of us is managing the correct production and reuse of man-made plastics. At least 50% of plastic packaging sent to NZ landfills is imported (Pac NZ, 2002). In-house recycling of plastic by manufacturers, where off cuts and production waste is reground and reused in the same or similar products; ensured 17,725 tonnes of plastics were reused in 2010 by the NZ plastics industry (PNZ Mass Balance Survey 2010). Plastic waste from manufacture in New Zealand makes up only 1% of material used (PNZ, 2010). Each New Zealander accumulates approximately 36 kg of plastic packaging per year and recycles 8.64kg (Packaging Accord). 97% of New Zealanders have access to household or community recycling (MfE). Plastic recycling has more than doubled over the last 5 years (Packaging Accord). In 2005 New Zealanders recycled 39,100 tonnes of plastic (Environment NZ 2007 report). 25-30% of PET (1) and HDPE (2) packaging produced in NZ are recovered (PNZ, 2002). 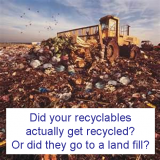 Why are land fills a problem? When decomposing, organic waste generates a greenhouse gas called methane and many chemically treated materials generate leachates. Leachates are produced when percolating water and other liquids pick up heavy metals and decomposing organic wastes. Uncollected leachate can contaminate groundwater and soil. Hazardous wastes can persist in the environment and enter the food chain, harming future generations. Approximately 93% of the materials we use never end up in saleable products at all but are discarded during the production process; approximately 80% of what we produce is discarded after a single use. Methane is 25x more damaging to the environment compared to CO2. A 1992 study found 7,200 potentially contaminated sites. Of those, 716 are landfill sites. Approximately 1,580 sites are potentially a high risk to human health and/or the environment. Recycling makes sense on many levels! You may think you have done the right thing in depositing recyclable waste in the right bin, but are you certain this is actually recycled?